TypeScript 3.0 focuses few new improvements that include project references, expansion of spread expressions with tuple types, generic rest parameters and corresponding inference of tuple types, the unknown type, support for defaultProps in JSX and more. For a complete list, check out 'What's new in TypeScript 3.0' section. If you are using Visual Studio to build applications for TypeScript, either upgrade to Visual Studio 2015 Update 3 or Visual Studio 2017 15.2 or higher. The latest version of Visual Studio 2017 can be found here. What's new in TypeScript 3.0? When a rest parameter has a tuple type, the tuple type is expanded into a sequence of discrete parameters. When a function call includes a spread expression of a tuple type as the last argument, the spread expression corresponds to a sequence of discrete arguments of the tuple element types. The last element of a tuple type can be a rest element of the form ...X, where X is an array type. When no other elements are present, a rest element in a tuple is identical to itself. Tuple types now permit a ? postfix on element types to indicate that the element is optional. TypeScript 3.0 allows you to include references of other projects. It also allows you to reference a different tsconfig.json file to make it easier to split your code into smaller projects. TypeScript 3.0 introduces a new type called unknown, that allows you to describe the least-capable type in TypeScript. TypeScript now supports a new type alias in the JSX namespace called LibraryManagedAttributes. It is a helper type that tells TypeScript what attributes a JSX tag accepts. TypeScript 3.0 gives a smarter, cleaner and more accurate error experience. In TypeScript 3.0, error messages can provide messages on other locations so that users can know the reason about cause-and-effect of an error. The deprecated function TypeChecker#getSymbolDisplayBuilder and associated interfaces have been removed. The deprecated functions escapeIdentifier and unescapeIdentifier have been removed. The TypeChecker#getSuggestionForNonexistentProperty, TypeChecker#getSuggestionForNonexistentSymbol and TypeChecker#getSuggestionForNonexistentModule methods have been made internal and are no longer part of the public API. How to download latest version of TypeScript 3.0? If you are using NuGet Package Manager, you can download TypeScript 3.0 by entering the following command: Install-Package Microsoft.TypeScript.MSBuild -Version 3.0.0. If you are using NPM, you can enter the following command: npm install -g typescript to upgrade to the latest binaries. TypeScript supports a list of different editors. To use with Visual Studio, you need either Visual Studio 2015 Update 3 or Visual Studio 2017 15.2 or higher. 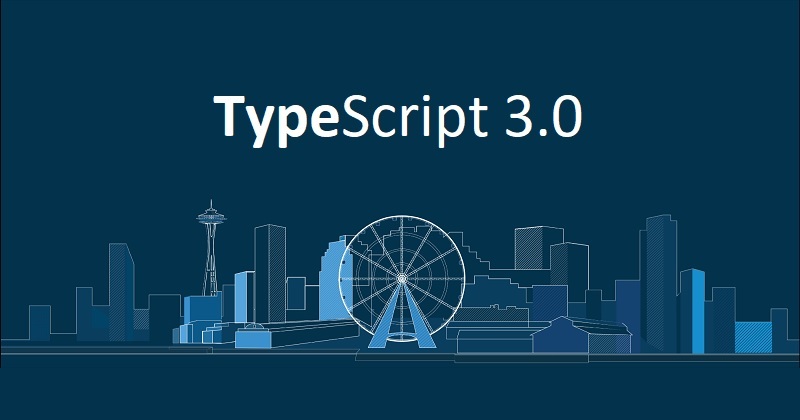 If you have come this far, it means that you liked what you are reading (TypeScript 3.0 is now available for download, and here's what's new in latest version of TypeScript).